From the North (Manchester) Take 293 (North or South) to the Brown Ave (airport) exit - this is Route 3A. Follow 3A south towards Litchfield. Approximately 3/4 of a mile after the Litchfield/Manchester line, take a left onto Forrest Lane and the first Right onto Brook Rd. [Note: if you reach T-Off's at Mel's, you've gone too far]. From the South/East (Nashua, Windham, Pelham, Salem) Take Route 111 (East or West) to Route 102 North (Hudson center). Take a left at the lights at the True Value hardware store onto Route 3A North through Litchfield. You will pass Wilson's Farms on your left, Griffin Memorial School on the right, Passaconaway on the left, and T-Off's at Mel's on the left. After passing under the high tension wires, take a Right onto Forrest Lane, then the first Right onto Brook Rd. The field is on the left after the curve on Brook Rd. - you will only be able to see a playground - park in the playground area. From the North (Manchester), take Route 293 to Brown Ave (Airport) exit. Take right (from 293 South) or left (from 293 North) onto Brown Ave. which is route 3A. Follow 3A South, going past T-Off's at Mel's on right, Passaconoway Golf Couse on right, past fire station on left. Field on left, just after curve in road, just before GMS School. Park in the school's parking lot and walk over to the field. From the South/East (Nashua, Windham, Pelham, Salem) take Route 111 (East or West) to Route 102 North (Hudson center). Take a left at the lights at the True Value hardware store onto Route 3A North through Litchfield. You will pass Wilson's Farms on your left, Griffin Memorial School will be about 1 mile from Wilson's. 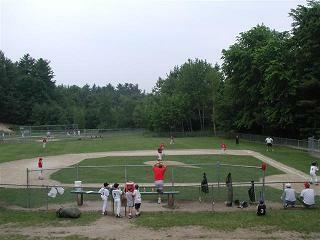 Park in the school's parking lot and walk over to the field behind the large mound beside the school. From the South/East (Nashua, Windham, Pelham, Salem) take Route 111 (East or West) to Route 102 North (Hudson center). Take a left at the lights at the True Value hardware store onto Route 3A North through Litchfield. You will pass Wilson's Farms on your left, Griffin Memorial School will be about 1 mile from Wilson's. Park in the school's parking lot and walk over to the field. From the North (Manchester), take Route 293 to Brown Ave (Airport) exit. Take right (from 293 South) or left (from 293 North) onto Brown Ave. which is route 3A. Follow 3A South, going past T-Off's at Mel's on right. Take left onto Robyn Lane for 0.6 miles then turn right onto Jeff Lane. Fields on right 0.2 miles. From the South/East (Nashua, Windham, Pelham, Salem) take Route 111 (East or West) to Route 102 North (Hudson center). Take a left at the lights at the True Value hardware store onto Route 3A North through Litchfield. You will pass Wilson's Farms on your left, Griffin Memorial School will be about 1 mile from Wilson's. Take right onto Robyn Lane for 0.6 miles then turn right onto Jeff Lane. Fields on right 0.2 miles. Home of the NH Fisher Cats AA affiliate of the Toronto Blue Jays. Sanel Park - Al Field Jr.
Al Field Jr. Field is the second baseball field on the right at Sanel Park. Located on 127 Old Suncook Rd., Concord NH. Briggs Field is the first baseball field on the right at Sanel Park. Located on 127 Old Suncook Rd., Concord NH. Take Exit 2 (Brown Ave - Route 3A) south to Litchfield. After 9 to 10 miles look for Wilson Farm stand (big barn down off the road) on right. Go 1/3 mile more and turn left on Talent Rd. Go 1.3 miles and turn left on Albuquerque. Go 1/2 mile and turn right on WOODHAWK Way. Take exit 4 (Derry - Londonderry) west toward Londonderry/Hudson/Nashua on route 102. In about 6 miles turn right on PAGE Rd. Connie's Restaurant will be on left just before Page Rd. Take exit 5 east toward Hudson on route 111 (goes through Nashua on Kinsley, then East Hollis streets ) over Merrimack river. At lights at far end of bridge turn left on route 102. In about 4 miles turn left on PAGE Rd. If you pass Connie's Restaurant on right you've gone 200 yards too far. Go 1 mile, turn right on Albuquerque Blvd. Note: Albuquerque comes up very fast just over a rise as another street comes in from the left.. Go about 1 mile and turn right on Woodhawk Way. Parking lot entrance is 100 feet on the left. Note: Woodhawk Way is ¼ mile beyond Campbell High School which is on the right side of Albuquerque as you head north. Follow Route 93 to Exit #4. Travel West on Route 102 toward Hudson for approximately 8 miles. Alvirne High School will be on the right side of the road immediately following the Hudson Motor Lodge. Follow Route 3 to the Route 111 Exit. Follow Route 111 through Nashua and across the Merrimack River. Stay to the left and turn onto Route 102 East. Follow Route 102 East for approximately 3 miles. Find Alvirne on the left. Take Route 111 through Hudson and continue on Route 111 towards Salem. Once in Windham you will come to a set of lights for Route 128 (Mammoth Road), take a right onto route 128 South. The field is about 4 miles down on the left. Prior to reaching the park/field you will see M & Ds Mini-Market and Mountain Orchard on the right. Optionally from Litchfield you can get onto 128 from the 4 corners Mall interection 102 and 128 in Londonderry. - From the East, Take 101 West to Exit 1. Proceed down the ramp and take a left at the lights. Continue straight to the traffic circle. Take 2nd traffic circle exit onto Londonderry Turnpike. Park is on your right hand side.